The Center for the Study of Social Difference working group Religion and the Global Framing of Gender Violence (RGFGV) cosponsors: Whose Feminism? 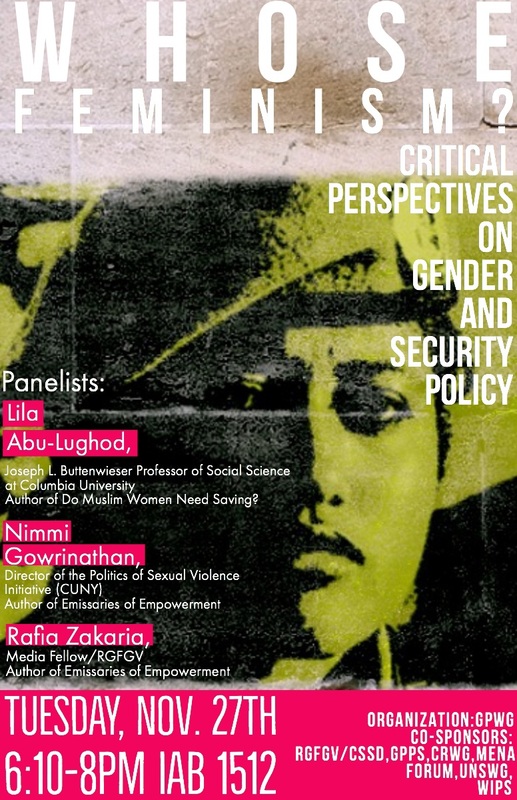 Critical Perspectives on Gender and Security Policy. Eighteen years after the passing of UN Resolution 1325 and the establishment of the Women, Peace and Security agenda, a critical examination of its usages and consequences on global governance institutions and security policy is in need. Join SIPA’s Gender Policy Working Group for a panel discussion on the consequences of 1325, securofeminism and how gender discourse is employed to different political agendas.